WATERLOO – As a student at Wilfrid Laurier University, Bill Webb mixed his degree in business with co-op work terms and a position on the varsity rugby team. He credits his experiences in the classroom, in the workforce and on the field with having the biggest impact on his life. Today, Laurier announced that Webb and his wife Dr. Agnes Wong have made a $1-million donation to Laurier’s School of Business and Economics. The donation will support the construction of the university’s new Global Innovation Exchange building (GIE). In making their gift, the couple hopes to give future students the same impactful experience that Bill had. The donation is part of Laurier’s Building Canada’s Best Business School fundraising campaign. The campaign aims to raise $55 million to support student scholarships, faculty research, new programs and building the GIE, which will house the School of Business and Economics and Laurier’s Department of Mathematics. In recognition of their gift, a 150-seat lecture hall on the first floor of the GIE will be named in honour of Webb and Wong. Since graduating from Laurier in 1986, Webb has built a successful career in the financial sector. He is executive vice-president and chief investment officer at one of Canada’s pre-eminent wealth-management firms, Gluskin Sheff + Associates. There, he has championed Laurier’s co-op education program, supporting the hiring of more than 100 students for co-op placements. Wong, who earned an MD from McGill University, is chief of Ophthalmology and Vision Sciences at SickKids and also a professor at the University of Toronto. Today’s gift builds on other donations that Webb and Wong have made in support of student scholarships and Laurier’s co-op and career services since 2005. They also champion the university in other ways. Webb is a member of Laurier’s President’s Council of Advisors and a volunteer for the fundraising campaign. 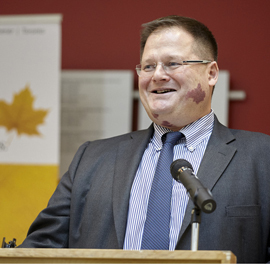 He received the inaugural Laurier Alumni Co-op Employer of Excellence Award and was named one of Laurier’s 100 Alumni of Achievement during the university’s centennial celebrations in 2011.